Type the release; double spaced; with at least one-inch margins on top, bottom and sides. If more than one page is used, each page should include your headline in uppercase lettering followed by the page number in the upper left corner; i.e., ECUMENICAL PRAYER SERVICE/2. A sentence or paragraph should not be carried over to the next page. Use hyphens only when they are part of a word; do not use them as a space-saver at the end of a line. Contact the press group, paper, station, etc. to determine the amount of lead time required for your release and to identify the person to whom the release is to be sent. If no specific person is given, address your press release to the editor or religion editor. __(Your_City,_State_and_Date) (number) congregations, representing (number) Christian denominations, will come together for an Ecumenical Celebration of the Word of God on (Day) , (Date) . The service, which will be held as part of the area's observance of the annual Week of Prayer for Christian Unity, will take place at (Location) beginning at (Time) . (Name) , (Title) , will deliver the message. Special music will be provided by (Choirs, and/or Soloists) . Begun in 1908, the Week of Prayer for Christian Unity is celebrated each year in cities and towns across the country and around the world. 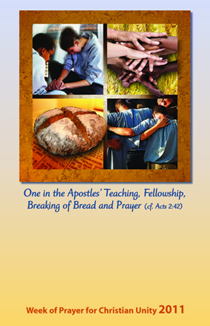 The theme for the 2011 observance is "One in the apostles' teaching, fellowship, breaking of bread and prayer" (cf. Acts 2:42) The theme and text for each year's observance of the Week of Prayer for Christian Unity are chosen and prepared by representatives of the Pontifical Council for Promoting Christian Unity and representatives of the World Council of Churches. The international texts are developed, adapted and published for use in the USA by the Graymoor Ecumenical & Interreligious Institute. The (City or Neighborhood) service is sponsored by (Sponsoring Group) . The public is cordially invited.